When we read the Bible we realize that family problems are nothing new, as a matter effect they started in the Garden of Eden when Adam first blamed Eve for giving him the forbidden fruit to eat (Genesis 3:12). Then we see the sibling rivalry between Cain and Abel and a little later between Jacob and Esau, and then the problems Joseph had with his brothers. Eli and Samuel dealt with rebellious children and Jonathan was almost murdered by his father, Saul. David was brokenhearted by his son Absalom’s rebellion and Hosea experienced marital difficulties. In each of these cases, relationships were damaged by sin. The Bible has a lot to say about relationships, as the first institution God established for human interaction was a family (Genesis 2:22–24). He created a wife for Adam and joined them forever. Citing this event, Jesus later said, “What God has joined together, let no man separate” (Matthew 19:6). God’s plan was for one man and one woman to remain married until one of them dies. He desires to bless that union with children who are to be raised “in the nurture and admonition of the Lord” (Ephesians 6:4). Most family problems emerge when we rebel against God and go against His original plan. This includes adultery, divorce, polygamy which all cause problems because they deviate from God’s original intend. The Bible gives clear instructions about how family members are to treat each other. God’s plan is that husbands love their wives in the same way that Christ loves His church (Ephesians 5:25, 33). Wives are to respect their husbands and submit to their leadership (Ephesians 5:22–24, 33; 1 Peter 3:1). Children are to obey their parents (Ephesians 6:1–4; Exodus 20:12). How many family problems would be solved if husbands, wives, and children simply followed those basic rules? 1 Timothy 5:8 says that families are to take care of their own. Jesus had harsh words for those who evaded their financial responsibilities to their aging parents by claiming they gave all their money to the temple (Matthew 15:5–6). We need to listen attentively and with an open mind. A lot of tension can be avoided if we don’t respond to our mate or any family member in a contentious tone. It is important to listen without prejudice and to respect his or her viewpoint even if we do not agree. Most family problems could be lessened if we all followed the instructions found in Philippians 2:3–4: “Do nothing out of selfish ambition or vain conceit. Rather, in humility value others above yourselves, not looking to your own interests but each of you to the interests of the others.” When we adopt the spirit of humility and treat others as Jesus would treat them, we can resolve many of our family and relationship problems. We will promote peace by being eager to forgive and to settle our differences quickly. “Bear with each other and forgive one another if any of you has a grievance against someone. Forgive as the Lord forgave you,” (Colossians 3:13). A good marriage or any relationship is impossible without forgiveness. Pray frequently. 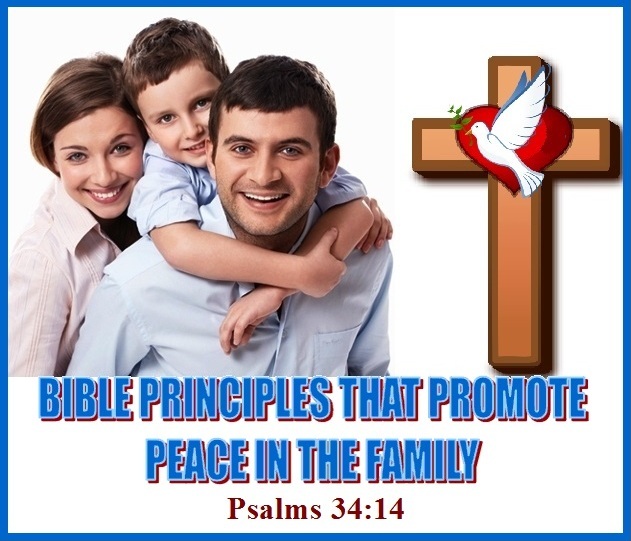 Ask God to bring peace into your home. Lift up the needs of the day and seek Him for wisdom. Speak kindly; it is amazing how a little kindness goes a long way to setting the tone for the home. Gather regularly, for prayer and for meals or to simply hang out with each other. Enjoy your togetherness. Show your family that you love them. Wrap your arms around your spouse. Give your little ones a hug. Your older kids would probably like one too! The world will continue to have wars and interpersonal conflicts until Jesus comes to establish true and lasting peace (see Isaiah 11:1-10), but God will give His peace to those who trust Him. Once His peace rules in our hearts, we are able to share that peace with others (Isaiah 52:7) and be ministers of reconciliation (2 Corinthians 5:18).